I know this story reported on by the eastsider web site, is a bit Los Angeles centric but the fact that a gas station owner has decorated his station so beautifully with mosaic art needs to be shared. Let’s encourage more of this kind of thinking. 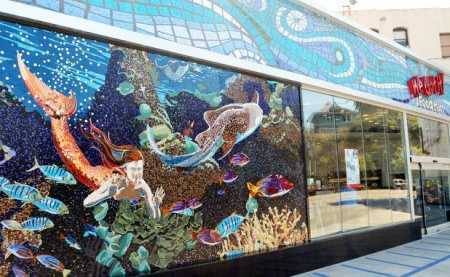 There are mermaids and other sea life adorning the United Gas Station in the Echo Park neighborhood of Los Angeles. Since we’re about to have a vote about lifting the mural ban at the City Council tomorrow, it’s nice that the beautification of businesses is already in full motion. The owner of this station is known for decorating his stations but I have to say, having driven by this place as it was being adorned, I am certainly looking forward to buying gas there as well as going inside to get the necessary refreshments. Check it out if you’re in the Echo Park area.